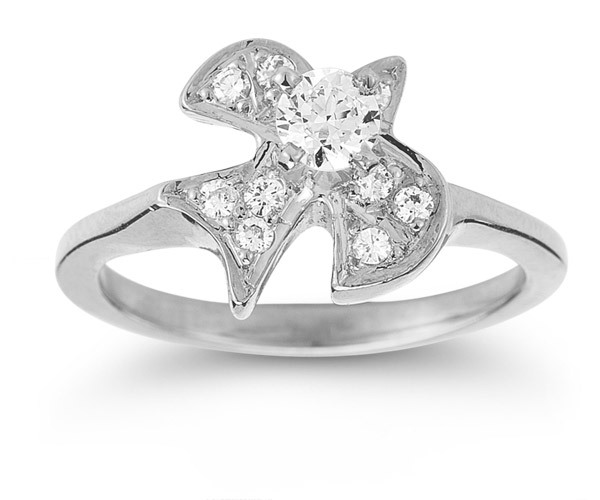 Fashion takes a faithful turn with this Christian Dove Diamond Ring from Apples of Gold. The beautiful profile of a dove brings the element of faith to this ring with a simple, clean design that's given just the right amount of radiant shine. A center white diamond measuring a quarter carat quickly captures the eye. Smaller white diamonds continue to grace the dove throughout, while the 14K white gold band gives this piece a classy, contemporary shine. Apples of Gold Jewelry guarantees the Christian Dove Diamond Ring in 14K White Gold to be of high quality and an authentic engagement ring with real diamonds, as described above.